OVER the Oakland, Calif., Airport, a few days ago, a silent plane slanted across the sky trailing a thin ribbon of white vapor. Spectators heard the pilot shout a greeting from the air. They saw him flash past, skimming the ground at a hundred miles an hour. They watched him bank into a turn, slide to a landing, and, with the propeller spinning backward, roll to a stop in less than a hundred feet. They had seen, for the first time in history, a man fly on wings powered by steam! Two brothers, George and William Besler, the former a geologist thirty-one years old, and the latter a mechanical engineer, two years younger, have achieved the dream of Maxim, Langley, and other pioneers of flight. Through their work, the steam-driven airplane, long talked about, long planned, has become a reality. This spectacular development in the field of aeronautics is the result of three years of secret experiment. 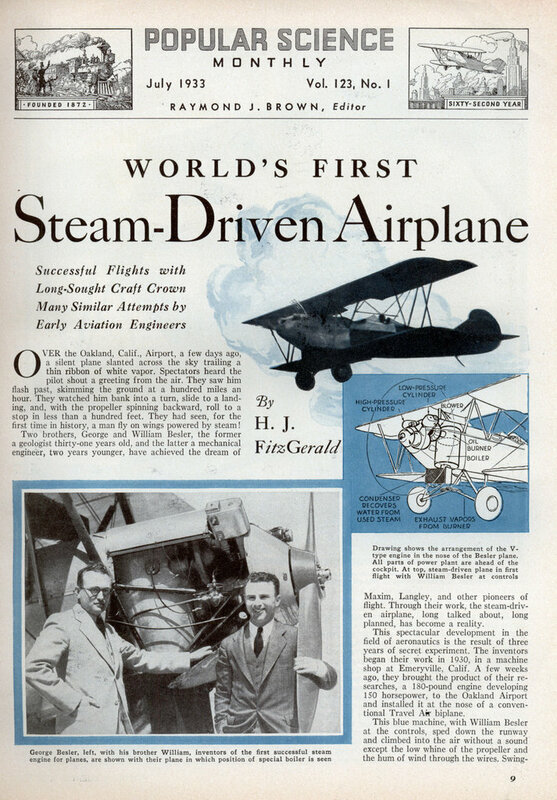 The inventors began their work in 1930, in a machine shop at Emeryville, Calif. A few weeks ago, they brought the product of their researches, a 180-pound engine developing 150 horsepower, to the Oakland Airport and installed it at the nose of a conventional Travel Air biplane. This blue machine, with William Besler at the controls, sped down the runway and climbed into the air without a sound except the low whine of the propeller and the hum of wind through the wires. Swinging back over the field at 200 feet, the pilot shouted “Hello!” and heard the answering calls from spectators below. Conversation in the craft, the two inventors told me when I interviewed them a few hours after their historic demonstrations, was as easy as conversation in an open automobile. Three times, the blue plane blazed a steam trail into the air, taking off, landing, circling about, remaining aloft for five minutes at a time. The constant, wearing vibration of the gas engine was gone; the smooth push and pull of steam power had supplanted it. Each time, as the machine swooped down and the wheels touched, Besler pulled back a small lever at the side of the cockpit and the steam engine at the nose of the ship instantly raced in reverse, whirling the propeller backward to act as a powerful brake and reduce the landing run to a minimum. This method of slowing down, possible only with steam power plants, applies the braking effect above the center of gravity and thus prevents nosing over in a quick stop. When wheel brakes are jammed on suddenly, a plane noses over or somersaults in a ground crash. Coming in at fifty miles an hour, the Beslers told me, the new steam plane can sit down and come to a stop in a field hardly a hundred feet square. The engine is a two-cylinder, compound, double-acting, V-type power plant. Its high-pressure cylinder has a three-inch bore and a three-inch stroke; its low-pressure cylinder has five and a quarter-inch bore and a three-inch stroke. Just behind the engine, the inventors showed me the barrel-shaped metal boiler which, with its super-efficient burner, explains why they have succeeded where others have failed in attempting to drive planes with a steam engine. Using vaporized fuel oil, the patented burner releases as much as 3,000,000 British thermal units per cubic foot of firebox space. This, they told me, is far in excess of anything hitherto attained. An electric blower drives this tremendous heat down among the flat spirals of a single 500-foot pipe coiled within the boiler. Three-eighths of an inch thick, inside measurement, at the bottom, the pipe gradually increases in size until it has an inside diameter of five-eighths of an inch at the top. The water supply to the coiled pipe is thermostatically controlled to keep the temperature constant regardless of pressure. UNDER the fuselage nose is the condenser which looks like an ordinary radiator for a water-cooled motor and which is said to recover more than ninety percent of the water from the used steam. By using a steam-feed water-pump, the inventors employ the exhaust vapor to pre-heat the feed water entering the boiler and thus decrease the time required to build up pressure within the coils. The operation of the power plant, once it is started, is practically automatic. At the start of a flight, William Besler climbs into the cockpit and flips over a small switch. Instantly the electric blower goes into action, driving air mixed with oil spray through the burner. Here, an electric spark ignites the mixture and sends a blowtorch of flame roaring downward around the coils of pipe. A few minutes later, steam pressure is high enough for the take-off. All the pilot has to do, from then on, is to operate the throttle and reverse lever. At 800 degrees F., the steam pressure built up within the coils reaches 1,500 pounds. With a 1,200-pound pressure, the engine will deliver 150 horsepower, whirling the propeller at 1,625 revolutions a minute. Tests have shown that ten gallons of water is sufficient for a flight of 400 miles. By increasing the size and efficiency of the condenser, the experimenters told me, they believe they can make this amount of water last indefinitely. As news of their sensational flights flashed to all parts of the country, eager interest was aroused among aeronautical authorities. The prospect of steam planes on the skyways opens up fascinating possibilities. Burning fuel oil so non-explosive that it merely smolders if struck by the flame of a blowtorch, the new power plant eliminates the menace of fire. In addition, the Beslers told me, enough fuel oil for a hundred-mile trip can be bought for forty cents. Because, above a thousand feet, steam-driven planes would be as silent as soaring birds, they would have particular value in military work. Noiseless war planes have long been sought. But muffling gasoline engines reduces their power to such an extent that the plan is impractical. The new power plant, silent by nature, would permit long-distance raids above the clouds by ghost ships giving off no telltale drone of motors to warn the enemy or to aid in directing anti-aircraft fire. MOST spectacular of all are the possibilities of steam on the airways of the stratosphere. In the thin atmosphere of this region, ten miles or more above the surface of the earth, experts agree, the highspeed transport ships of the future will fly. Here there are no clouds, no storms, and the steady trade winds of the upper blue will increase the speed of long distance passenger, mail, and freight machines. Already, here and abroad, stratosphere ships, with pressure cabins and variable-pitch propellers, have been designed and are under construction. Test hops have been made in such highflying experimental craft in France and Germany. The chief stumbling block at present is the gasoline motor. It steadily loses power as it ascends. Climb to 20,000 feet and a motor that delivers 150 horsepower at sea level will retain only half its power. Spiral on up to 30,000 feet and your engine will have but three-tenths of its sea-level horespower. And you are then only half way to the stratosphere! Superchargers, driving a blast of air into the carburetor to make up for the reduced pressure in rarefied atmospheres, help these gasoline motors. They are heavy, however, adding to the weight of the plane, and they never completely prevent loss of power at high altitudes. Now consider the steam engine. It loses no power at all with altitude and gains in efficiency the higher it goes! This is because the pressure on the exhaust is less in thin air than at sea level. Thus the perfection of the flying steam engine is a vital step toward conquering the stratosphere. Realizing these facts, inventors in various parts of the world have been working toward the goal achieved by the Besler brothers. In Akron, Ohio, last fall, a local inventor, Harold C. Johnson, announced the completion of a steam engine with two opposed cylinders, weighing, complete with boiler, only 146 pounds. Some months earlier, it became known that the Great Lakes Aircraft Company, at Cleveland, Ohio, was working upon an experimental steam-driven biplane. Recent dispatches from France reported that a Paris mechanic had perfected a light steam power plant for airplanes. Another news item, coming from Sweden, told of steam-turbine engineers who are working on a new-type turbine for aircraft use, while a third, from Italy, carried the information that G. A. Raffaelli, an aeronautical engineer, had announced a steam engine for stratosphere machines. But it was the two California inventors, carrying on their secret researches, who first achieved the long-sought goal of steam-driven flight. Ever since Henri Giffard, in 1852, navigated the air in the world’s first dirigible, creeping along near the outskirts of Paris at seven miles an hour propelled by a clumsy three-horsepower steam engine weighing 462 pounds, there have been proponents of steam power for aircraft. Many of the pioneers of flight, before the perfection of the gas engine, sought to fly by steam. In 1894, Sir Hiram Maxim, the English inventor, spent $200,000 building a gigantic multiplane weighing 8,000 pounds and having a wing area of almost 4,000 square feet. 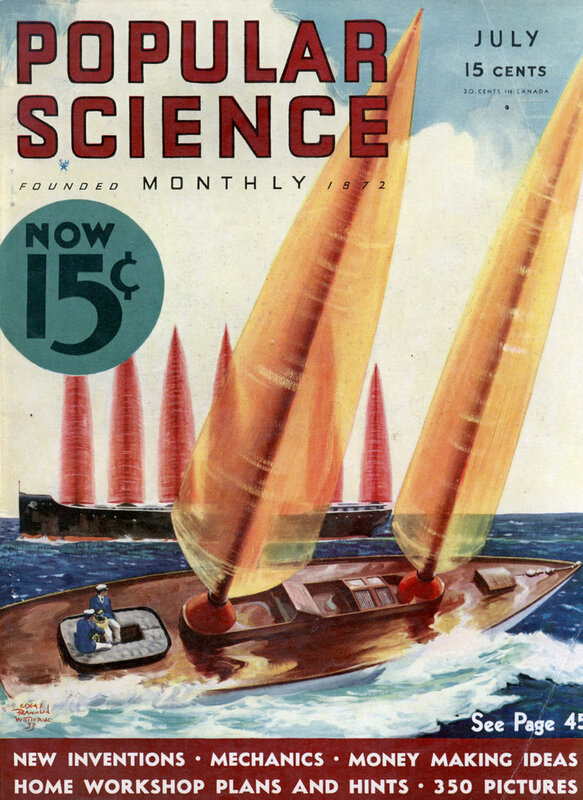 Driven by a 363 horsepower steam engine and two eighteen-foot propellers, the giant craft reached thirty-six miles an hour on special tracks built to hold it down during the preliminary tests. Its lift at this speed was so great that it tore loose from the tracks, crashed over on one side, and demolished itself. Two years later, Samuel Pierpont Langley, secretary of Smithsonian Institution, Washington, D. C, saw his sixteen-foot model fly for half a mile above the Potomac River propelled by a miniature, seven-pound steam engine, developing one and one-half horsepower. The full-sized tandem monoplane which Langley patterned after this model in 1903 and which was broken in launching, carried a gasoline motor instead of a steam power plant. After 1903 and the success of the Wright Brothers, steam power for aircraft was practically lost sight of. Gasoline engines made such rapid advance in lightness and reliability that they came into universal use in aviation. Recently, however, the advantages of steam power have again been attracting an increasing amount of attention. With the first experimental machine already climbing into the air at Oakland, steam has, at last, been harnessed to work in the sky. Experts are watching the progress of the inventors with the keenest interest. Their machine is a definite step toward the huge, winged steamers of the sky visioned by pioneers of flight. Very cool! I never knew this was possible. I always thought steam drive didn’t have a high enough power to weight ratio. That might have come in handy in WWII. Yep, steam planes are quite feasible. Its just that an IC motored craft will have endurance a few times greater.